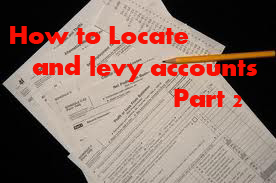 How to Locate and Levy Accounts. Armed with your debtors Name, Address, and SSN you can now locate any open bank accounts this subject may have. What that will do is enable you to file a writ with the court (this may be called something different in your state). 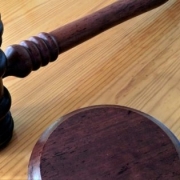 A writ will typically allow you or the sheriff (depending on the laws in your state) to serve the Financial Institution with a formal demand to levy the bank account for funds equal to or as much as the amount of your judgment. The private investigators that sell services on the bestpeoplesearch.com portal can locate these accounts. Understand that you can only levy accounts in your subjects name (not the spouse, the brother, the uncle, etc). If your judgement is in the Name of an Individual and a Corporation you can locate and levy business accounts as well. However, for that search you will need the business name and FEIN number in place of a SSN. This is a great tool for judgment recovery and is one of the main avenues used by law firms and judgment collection specialists who pursue judgements to collect funds.